Today I'm venturing out a little. Not as in physically going some place but I'm trying out a link up for the first time. I see so many do it and am excited to join!! 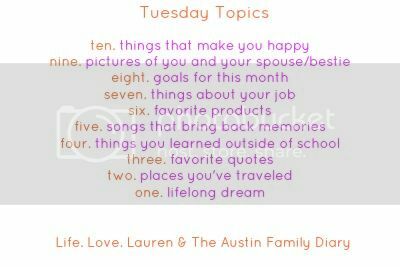 First though, I wanted to take a moment and grab the topic today for Blog Everyday in May. I know I havent done this in forever. Total fail! I liked today's topic though because I can go back and see what a bore I was when I first started blogging. Be glad you all weren't following me then! I was so excited to share this recipe with you all. My mom does it in the crock pot and puts the Pillsbury rolls in as the dumplings. Needless to say, one of my favorite meals! This was a tough post for me and I'm sure everyone else that wrote a post just like it. But I'm proud of it...Boston Strong! This post makes me sound so innocent! It also probably proves to everyone that I'm very boring lol. Its OK though, I'm actually proud of things I havent done! Its better in the Bahamas...plain and simple! It's funny because this was maybe my 6th post or so when I first started blogging. I had no idea what I was doing at the time. This post was kind of inspired by another blogger at the time and I knew I wanted to do it but had no idea how to write it. Its a special post to me. I actually just sat here and re read it and let me say, I think its pretty good. It's an important post for anyone..some good life lessons. Those are some of my favorites! But I am proud of every post I've written. And am so thankful for you all who have made each post special! Now, its onto my new link up. I just realized that the Blog Everyday Challenge had basically the same prompt so thats a win win! 2) Bailey- He's just great and I love him! 3) Brian- 5 years ago I never would of thought I'd be in the relationship I am today. Back then I felt trapped in a terrible relationship and always thought that I'd be alone. 4) The house I live in, the clothes on my back and every little thing Ive bought. I'm blessed and grateful for all of this. I pray that the people in Oklahoma stay strong and know there will be better days. 7) Chocolate- do I even need to say why this makes me happy? I totally understand you on 10. Well said. Oh and chocolate is my weakness! Thanks for linking up! I can't wait to read more from you! xoxo. I love the sunshine and warmth too. In so glad it finally heated up here in MD! How am I so behind on your blog?? Ah, sorry. The sun makes me so happy too!! But it's MISERABLE out here right now! It's FREEZING! It feels like it's winter! Seriously, I don't know what Mother Nature is smoking, but she has to stop. I want some sun!